Lake Huron Weather (lakehuronweather.org) is independently owned and operated and provided as a free service to the community. The weather data used for this site is collected from a Davis Vantage Pro 2 weather station using Weather-Display software (10.37S-(b60)), Virtual Weather Station software (v15.0), and WeatherLink software (v6.0.3). The weather station is located approximately 300 feet from the shore of Northern Lake Huron in Cordwood Point No. 1, Cheboygan Michigan. The station sensors include an anemometer, rain gauge, temperature, humidity, and barometric pressure. The anemometer is attached to a tri-pod which is mounted on the roof, approximately 40 feet above ground level. The rain gauge, temperature, humidity, and barometric pressure sensors are mounted approximately 5 feet above a grassy area. The sensors transmit their data wirelessly every 2 seconds to two (2) Display Consoles which are connected to a personal computer running Windows 7. The [hard] data is uploaded to the web site approximately every 6 minutes and the [flash] data is refreshed approximately every 10 seconds (green text flashes when uploaded). The computer runs 24/7/365. Additional weather data is collected from organizations and used in displaying various weather information: e.g. radar, satellite, alerts, trends, etc. The National Weather Service alerts are updated automatically every 10 minutes. The collected data is uploaded to various weather networks including the Citizen Weather Observer Program (CWOP); CWOP then distributes the data to the National Weather Service (NWS) & the National Oceanic and Atmospheric Administration (NOAA). Data is also uploaded to the following organizations: Personal Weather Stations, Weather Underground, Midwestern Weather Network , Weather for You, WeatherLink, Weather Cloud, and AWEKAS. The NOAA Weather Radio All Hazards (NOAA Radio) broadcast is powered by a Midland WR300 Weather Alert Radio. The Radio is set to WNG572 out of Emmet County on a frequency of 162.475 MHZ. The radio audio output is connected to the line-in on the sound card of the weather computer. BroadWave Streaming Audio Software on the weather computer encodes the audio signal into a MP3 stream and sends that MP3 stream to the internet. The BroadWave software runs on the PC as a server to stream the live audio over the web, anyone with an internet connection can then listen to the stream. Our radio stream is picked up and re-broadcast by NOAA All Hazards Weather Radio; Personal Weather Website Owners and TuneIn Internet radio. The streaming audio coverage is for the Straights Area, Cheboygan County, Emmet County, and portion of Mackinac and Antrim Counties. 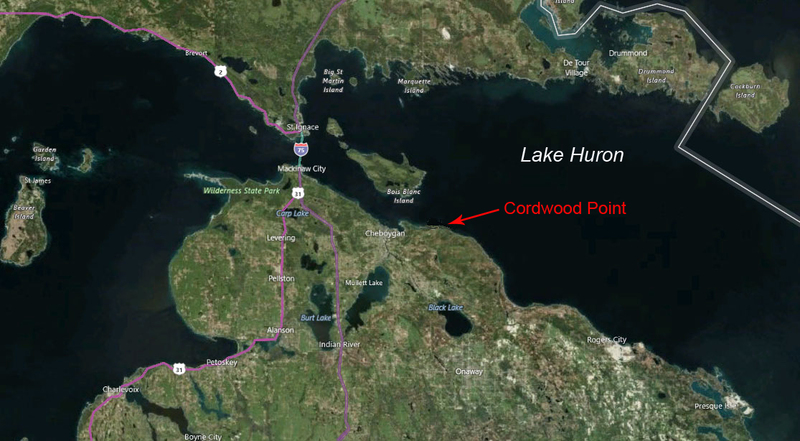 Cordwood Point is located in Cheboygan County, Michigan, approximately 7 miles east of Cheboygan. Cordwood Point is cataloged as a "Cape" by the U.S. Board on Geographic Names and its elevation above sea level is equal to 581ft. Cheboygan is a city at the confluence of Lake Huron and the Cheboygan River with panoramic views of the Straights of Mackinaw and Bois Blanc Island. Per the 2010 census, Cheboygan had a population of 4,876. The City is the gateway to the [inland waterway]; a series of navigable lakes and rivers. The inland waterway is the longest chain of rivers and lakes in Michigan. Cheboygan is also home to the North Central State Trail trail-head and the Alpena Trail; both former railroad lines now converted to pedestrian use in the summer and snowmobile use in the winter. The Cheboygan economy is based upon tourism, manufacturing, and the service industry, which all play vital roles in the local economy. The diverse history of the community has in many ways shaped what it is now and, very likely, what it will become in the future. Community leaders and business owners are committed to the continued growth of commerce in the area, making it an ideal place to do business or to simply enjoy life. The river was originally quite shallow, which helps explain the origin of the name [Cheboygan]. It probably comes from the Annishinaabe (Ojibwa) zhiibaa onan, meaning a channel or passage for a canoe. There is plenty of evidence of more permanent settlements by Native Americans further down the river, as well as along Mullett and Burt Lake shores. 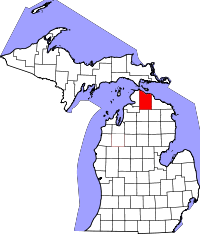 Cheboygan County is a county in the U.S. state of Michigan. As of the 2010 census, the population was 26,152. The county seat is Cheboygan. The county boundaries were set off in 1840 and county government organized in 1853. According to the U.S. Census Bureau, the county has a total area of 885 square miles (2,290 km2), of which 715 square miles (1,850 km2) is land and 170 square miles (440 km2) (19%) is water. The county is considered to be part of Northern Michigan. This site is a template design by CarterLake.org with PHP conversion by Saratoga-Weather.org. Special thanks go to Kevin Reed at TNET Weather for his work on the original Carterlake templates, and his design for the common website PHP management. Special thanks to Mike Challis of Long Beach WA for his wind-rose generator, Theme Switcher and CSS styling help with these templates. Special thanks go to Ken True of Saratoga-Weather.org for the AJAX conditions display, dashboard and integration of the TNET Weather common PHP site design for this site. Template is originally based on Designs by Haran.